The 2018 Harvard Varsity Club Hall of Fame class features five of Harvard’s most accomplished student-athletes (photo courtesy Brian Panoff '98). 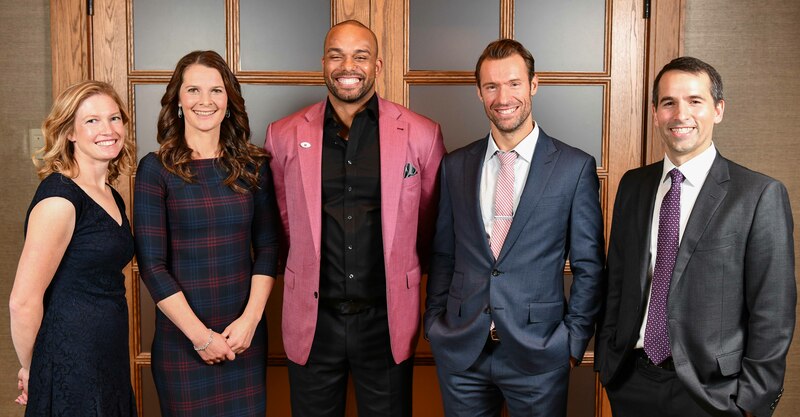 The Harvard Varsity Club welcomed five members to its Hall of Fame as the Class of 2018 during a dinner and induction ceremony at the Harvard Club of Boston's Downtown Clubhouse on Saturday, October 13. Jennifer Botterill ’02-'03 (ice hockey), Dominic Moore ’03 (ice hockey), Carl E. Morris ’03 (football), Daniel J. Shevchik ’03 (swimming & diving), and Tiffany Whitton Gould ’03 (softball) joined the nearly 550 student-athletes from Harvard’s 42 varsity teams who have previously been inducted into the Hall of Fame. Click on the links next to each inductee's name to view their acceptance speech, personal reflection, and/or video introduction. 2-time Patty Kazmaier Award winner as the top player in NCAA Division I women’s ice hockey (2001, 2003), only student-athlete to earn the award twice … 4-time All-America first team (1999, 2000, 2001, 2003) … 3-time ECAC Hockey and Ivy League Player of the Year (2000, 2001, 2003) … ECAC Hockey Rookie of the Year and All-Rookie Team (1999) … 4-time ECAC Hockey first team (1999, 2000, 2001, 2003) … ECAC Hockey All-Tournament Team (2003) … Beanpot Hall of Fame inductee (2008) … 3-time Beanpot MVP (2000, 2001, 2003) … Radcliffe Prize Recipient (2003) … Scored game-winning goal to lead Harvard to the 1999 AWCHA National Championship … Helped Harvard to two NCAA Tournament Frozen Four appearances (2001, 2003) … 2-time Ivy League Champion (1999, 2003) and 1-time ECAC Hockey Champion (1999) … 4-time Beanpot Champion (1999, 2000, 2001, 2003) … Harvard’s all-time leader in goals (157) and points (340), ranks 2nd in assists (183) … NCAA record holder for career points per game (3.07), points in a game (10), and assists in a game (7, twice) … 4-year letterwinner … 2-time captain (2001, 2003) … 3-time Olympic gold medalist (2002, 2006, 2010) and earned one Olympic silver medal (1998) playing for Canada … 5-time IIHF World Championships gold medalist, 3-time silver medalist … Scored 310 points across 165 professional games for the Toronto Aeros, Mississauga Chiefs and Toronto Furies … Manitoba Hockey Hall of Fame (2017). All-America first team (2003) … 2-time ECAC Hockey selection (2003 first team, 2001 second team) and 4-time All-Ivy League selection (2001 and 2003 first team, 2000 and 2002 second team) … ECAC Hockey All-Tournament Team (2003) … Ivy League Rookie of the Year (2000) and ECAC Hockey All-Rookie Team … ECAC Hockey All-Decade second team … John Tudor Memorial Cup recipient as Harvard MVP (2003) and George Percy Award recipient as Harvard Rookie of the Year (2000) … ECAC Hockey Champion (2002) and Ivy League Champion (2000) … Ranks 9th in Harvard history in career goals (64), 11th in assists (88) and points (147) … 4-year letterwinner … Captained 2003 Harvard men’s hockey team … 13-year NHL veteran currently playing for the Toronto Maple Leafs … Has scored 311 career points across more than 1,000 regular season and playoff games … Bill Masterton Memorial Trophy recipient (2014) as the NHL player who best exemplifies the qualities of perseverance, sportsmanship, and dedication to ice hockey. 2-time All-America selection (2002 first team, 2001 third team) … 2-time Ivy League Player of the Year (2001, 2002) … 3-time All-Ivy League selection (2001 and 2002 first team, 2000 second team) … Finalist for the 2003 Payton Award, given to the top player in Division I-AA ... Rated by the Sports Network as the nation's top wide receiver in Division I-AA in 2003 ... Harry Agganis/Harold Zimman Award recipient as the outstanding player in New England (2002) … 2-time Frederick Greeley Crocker Award winner as Harvard’s MVP (2001, 2002) … Ivy League Champion (2001) … Harvard’s all-time leader in career receptions (245), touchdown receptions (28) and receiving yards (3,488) … Played in both the Hula Bowl and East-West Shrine Game as one of the best senior football players in the NCAA (2002) … 4-year letterwinner … Played two seasons in the NFL. 4-time All-America honoree in the 200 backstroke (2000, 2002) and 400 IM (2001, 2002) … 4-time All-America honorable mention in the 400 IM (2000, 2003), 200 free relay (2000), and 800 free relay (2000) … 12-time Ivy League Champion in the 200 backstroke (2000, 2001, 2002, 2003), 200 IM (2001, 2002, 2003), 400 IM (2000, 2001, 2002, 2003), and 800 free relay (2000) … 14-time All-Ivy League honoree … At the time of his graduation, held Ivy League Championships meet records in the 200 backstroke, 200 IM, and 400 IM ... 4-time recipient of the Phil Moriarty Award as the Ivy League Championships Swimmer of the Meet ... Recipient of the Harold Ulen Award as the Ivy League's Career High Point Swimmer ... 3-time recipient of Harvard's Eugene B. Wyman Trophy as the team member who scores the most points in dual meets, and the William J. Brooks Trophy as the swimmer and/or diver who contributes the most to the success of the team ... Honored with Harvard's Stowell Trophy as the senior who, through perseverance, diligence, and untiring self-sacrifice, has most improved during his collegiate career ... Led Harvard to 3 Ivy League championships (2000, 2001, 2003) ... Harvard record holder in the 400 IM (3:46.17), ranks 6th in the 200 IM (1:46.98) … 4-year letterwinner … Captained 2003 Harvard men’s swimming and diving team ... Won a bronze medal for Team USA at the 1999 Pan American Games in the 200 meter backstroke. All-Northeast Region first team (2002) … ECAC All-Star Team honorable mention (2003) … Ivy League Player of the Year (2002) … 4-time All-Ivy League first team (2000, 2001, 2002, 2003) … 3-time recipient of Harvard’s Best Offensive Player award (2000, 2001, 2002) … Mary G. Paget Prize recipient (2003) … 2-time Ivy League Champion (2000, 2001) … Ranks among Harvard’s career leaders for batting average (.402, 2nd), slugging percentage (.677, 2nd), on-base percentage (.449, 5th), runs scored (92, 8th), hits (189, 4th), doubles (43, 2nd), home runs (28, 2nd), RBI (106, 5th), and total bases (318, 4th) … 4-year letterwinner … 2-time captain (2002, 2003). Founded in 1967 to honor the greatest student-athletes in Harvard History, the first Hall of Fame induction class featured 50 former student-athletes from the Class of 1931 and prior. The Executive Committee of the Harvard Varsity Club appoints a selection committee to oversee the Hall of Fame induction process. To earn induction, student-athletes must be a graduate of Harvard for at least 15 years, and have acheived greatness in a sport for multiple years while competing for the Crimson. Visit the Harvard Varsity Club Virtual Hall of Fame for information on all student-athletes inducted into the Hall of Fame.